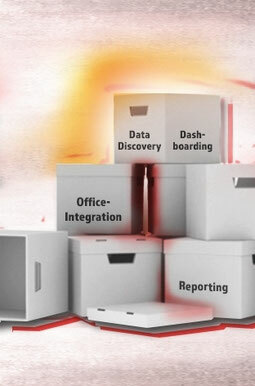 In the Data Discovery & Dashboarding area, the main product is SAP Lumira 2.0, for Office Integration Analysis Office and in the Reporting area Crystal Reports Web Intelligence. SAP Lumira 2.0 is the completely revised successor of SAP BO Design Studio and SAP Lumira and combines both central front-end tools for creating management and self-service dashboards. The two tools for Self Service BI, Design Studio and Lumira, share the same technological basis. The advantage: The different departments can work better with the IT department because dashboards or analyses developed in the departments can be used by IT as a basis for more complex dashboards or function enhancements. You'd like to know more about SAP Lumira 2.0? Click here for your personal demo.